Live like a local in South Palm Desert! This beautifully upgraded 2000 square foot mid-century home is located in the historic Silver Spur community. 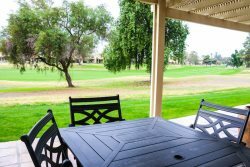 Enjoy mountain views, peaceful surroundings, close proximity to shopping and dining on El Paseo, Living Desert, hiking trails, golf courses and more. Property is a single family home located in the beautiful Silver Spur Ranch neighborhood. This is a peaceful and quiet area perfect for early morning strolls, lazy afternoons by the pool, or entertaining guests by the BBQ.